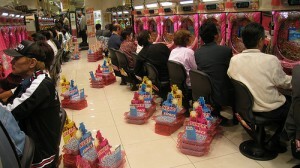 [W:Pachinko] is one of the most popular amusements in Japan. 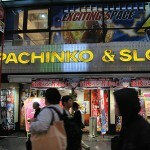 Pachinko parlors are everywhere, and it’s easy to find them because they are loud and bright. Pachinko is a kind of vertical pinball game, which shoots small metal balls continuously. The player pours some balls into the feed chute and turns handle to fires a ball up into the machine. You can exchange the remaining balls for prizes; however, the balls can’t be exchanged directly for cash because gambling for cash is illegal in Japan. One of the reasons for the popularity of pachinko is that there are all kinds of pachinko machines, which feature famous people, TV drama, anime or game characters, for instance. Gambling in Japan IS legal (horse racing, boat racing and bicycle racing are all examples). Pachinko is legal to play, but illegal to use as gambling. It is this aspect only that is overlooked by authorities. So modern parlours have moved more and more towards pushing players to cash in smaller wins for actual goods. That is not to deny the still massive amount of players who convert winnings to cash at non-disclosed nearby ‘swap’ locations. There’s a LOT more to this fascinating game than its shiny, loud surface initially conveys….